Dye Sensitized solar cells (DSSC), also sometimes referred to as dye sensitised cells (DSC), are a third generation photovoltaic (solar) cell that converts any visible light into electrical energy. This new class of advanced solar cell can be likened to artificial photosynthesis due to the way in which it mimics natureâ€™s absorption of light energy. 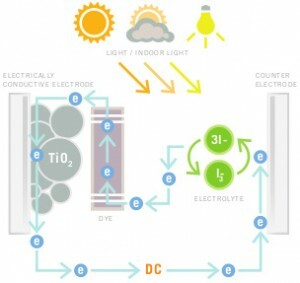 Dye Sensitized solar cells (DSSC)Â were invented in 1991 by Professor Michael Graetzel and Dr Brian Oâ€™Regan at Ã‰cole Polytechnique FÃ©dÃ©rale de Lausanne (EPFL), Switzerland and is often referred to as the GrÃ¤etzel cell, we call it GCell. 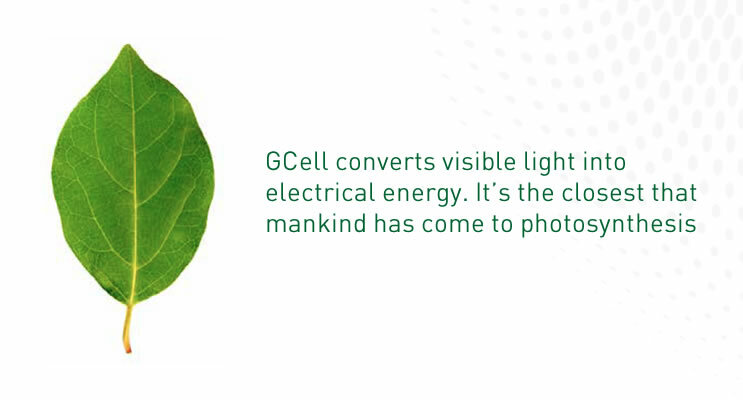 DSSC is a disruptive technology that can be used to produce electricity in a wide range of light conditions, indoors and outdoors, enabling the user to convert both artificial and natural light into energy to power a broad range of electronic devices. The electron is conducted away by nanocrystalline titanium dioxide (a nano-scale crystallized form of the titanium dioxide). It is the movement of these electrons that creates energy which can be harvested into a rechargeable battery, super capacitor or another electrical device. Watch a shortÂ animation onÂ Dye Sensitized Solar Cells.